﻿Born in Kansas City, Missouri - Mark spent his childhood drawing and painting whenever he could - he grew up watching his Father, a part time commercial artist, work at home on various projects. Taking every art class available from elementary school on - Mark was hooked at an early age. After High School, Mark attended Texas State Technical Institute where he studied Architectural Drafting and Design and from there attended Texas A&M University. Mark worked as an Illustrator for the Texas A&M Department of Archaeology while studying there. Fascinated with the entire creative process, Mark works with Pencil, Watercolor and Oil - he’s known for his use of high contrast and bright color within his compositions. Painting and drawing a wide variety of subject matter - Mark's artistic style can be defined as Imaginative Realism. 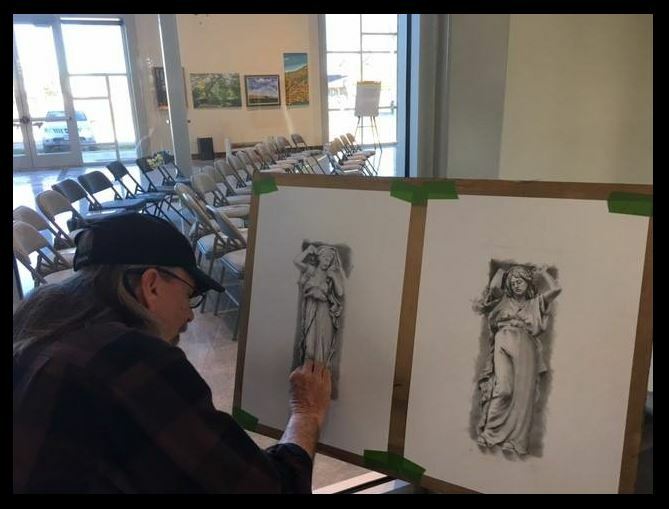 Mark is an Artist Member of the American Society of Aviation Artists and regularly attends the ASAA’s international competitions and forums. At the 2013 forum and competition Mark was presented with the coveted "James V. Roy Jr. Award" for his work entitled “The Lunarian Man” - this award represents the "Best of the Best" for work submitted by an ASAA member. After retiring from a long career in IT Operations and Infrastructure, Mark and his wife Melisa have recently relocated to Giddings, TX allowing them to spend more time with their children and grandchildren who live in Bastrop and Austin. Mark is an active member of the Lost Pines Art League and is currently an instructor at the Lost Pines Art Center located in Bastrop, TX.